Speed reading can be an outstanding strategy to overcome information overload, filter out what is important and save you precious time to do the things that will add value to your life. While the process of reading quickly is core to the process, you would be right to think there is much more to it. If you want to get from London to Brighton, make a few stops along the way and quickly get to your destination, would you choose a car or a bicycle? In this scenario a car would be your best form of transport. If however, it is a sunny day and you want to enjoy the scenery with a group of friends, perhaps a bicycle is more suited. Being able to do both offers you greater choice. You could think of reading in the same way, there will be occasions when you want to savour a book and enjoy the story. Often you will simply want to get from A to B, understand key concepts and get quick results. Having a range of reading speeds offers you this choice. Here's a few of the key strategies that can take your reading skills to another level. Priming is a strategy that will set your brain up for a great learning experience. A simple example of this is where you buy a new gadget or item of clothing and you start to notice that other people have the same thing. Your brain has been primed to give this item some importance, it turns on your internal radar and subconsciously directs your attention. Ask yourself this simple question before reading an article or book “What do I want this book to give me?” if you have no idea then take a guess, think about your answers, seriously, really think about this, engage with the answers intellectually and emotionally. Write down what you come up with and in doing so you are more likely to pick up relevant information when you start reading. Before going on a journey you would check your map or drop it into google in your phone before selecting the appropriate route. Do the same with reading, preview for the big picture view, study the TOC, chapters, headings and the index for anything that catches your attention. Read like a child! Think back to when you were learning to read as child, what did you do? If you are like most you probably used your finger to guide your eyes. This helped to stop your eyes from jumping backwards in the middle of a sentence either consciously or sub-consciously; this is referred to as back skipping and regression. Why not re-kindle this technique? Use a ‘pen’ as a guide for your eyes, move it smoothly under each line, building up speed as you go. Remember what it was like as a learner driver? You were so focused on the process that you probably didn’t take much else in. 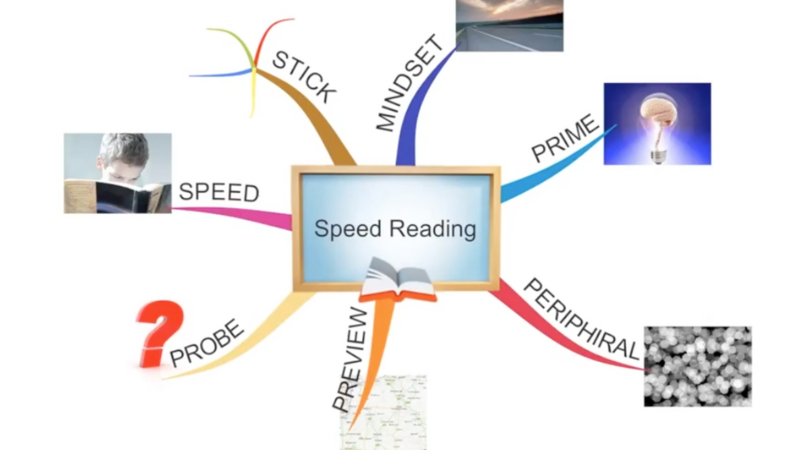 Speed reading is no different, it takes time for your brain to switch onto automatic pilot, only then will you start to notice more things along the way and see increased comprehension. Become a detective... It’s quite natural to read a fictional book and be able to recite the whole thing front to back then talk through the story including the details. This is because we find it easy to remember stories, especially if they are vivid and include location and emotion. When you let your imagination make stories out of non-fiction this brings it to life in your mind, so when it comes to probing your brain to remember the things of value, it is 10 times easier. You become a detective looking for clues as your read, bringing to life the important information and then asking yourself searching questions that help you to recall those clues. As you practice recall try doodling your thoughts and sharing your learnings verbally (this will improve comprehension of the material). Dealing with information overload, creating more time in your life and remembering key information that furthers your ambitions is easier than many people think. Here's the challenge though, there are no 'magic pills' or 'cheap tricks' to make it happen. Like learning any new skill, speed reading takes effort, energy and rehearsal. It's most likely not going to work how you would want it to straight away, so if you are committed to increasing your reading speed by over 300% or more, then get ready to do some work. Fail a few times, learn what works fast and bust through the learning curve. With this mindset you will open up a new world of learning. Drop me your comments and thoughts below!